The Indian Express: Following the death of 22 children in Bihar due to pesticide in midday meal, the Pimpri-Chinchwad Municipal Corporation has decided to review its system of serving food to primary school students. The PCMC has allotted nearly 50 per cent of the midday meal work to ISKCON, while rest of the work has been assigned to self-help groups and other private parties. Municipal Commissioner Shrikar Pardeshi said he would review the midday meal scheme that has been put in place by the civic body. "After what happened in Bihar, we will review our midday meal scheme," he said. Activists and members of self-help groups said midday meal raises questions of hygiene. "In some places in Pimpri-Chinchwad, midday meal is cooked near gutters and nullahs as the parties do not have proper space. If food is cooked near such places, how can we ensure hygiene and the health of children?" asked Anita Landge, president of Damini Bachat Gat, a self-help group. Bachat gats are run by 18 members who are mainly housewives. "The members are not from well-to-do families. They run the gats just because they have to. But does that mean we will compromise with the health of children. If the quality of the preparations are checked, only then the PCMC will realise what is actually happening at the ground level," Landge said. Sulbha Ubale, president of the Pimpri Chinchwad Bachat Gat Mahasangh, said the midday meal provided by PCMC does not have quality. "There are frequent complaints from children and parents about the quality of the food served. It seems PCMC officials are not keen on keeping a tab on how the food is prepared. If they inspect the food preparation closely, I am sure they will be shocked to see the lack of hygiene conditions in places from where they operate," she said. Ubale said PCMC should instead implement the 'Central Kitchen' plan. "If there is a centralised kitchen, the problem of quality and transportation could be resolved to a large extent. Also if PCMC allots space for kitchens in the schools itself, the hygiene problem will be solved. Kitchens in schools would also help serve hot and fresh meals which is very necessary since we are talking of providing nutritious food to children," she said. In past few years, at least six-seven incidents of worms found in midday meal has been reported. 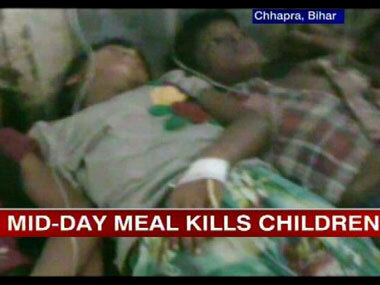 In one incident, several students fell ill after eating food served by ISKCON. However, it was later revealed that the food served had no problem. Civic officials suspected that it might have been an act of sabotage as certain sections opposed the contract be given to ISKCON.